One Trip to Mystic Aquarium-- Multiple Subjects Covered! 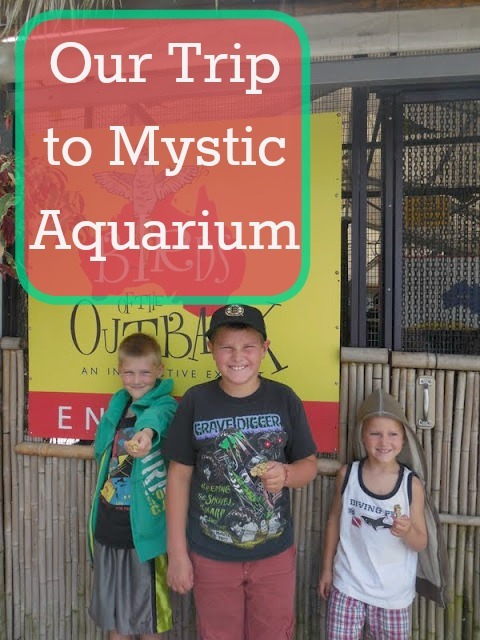 We headed out for a day at Mystic Aquarium and listened to a bit more of Treasure Island on the car ride there. I'll be honest and admit that I don't really like this book. It's boring (to me) and I'm constantly getting confused because I'm not always listening as well as I should. The boys, however, seem to enjoy it, Ian especially. He quickly summarizes the story for me when I turn it off to ask a quick question so I know he's following along. I dread listening to the whole thing but I can't bear to tell them they can't listen to it! We did take breaks from the story and use our Brain Quest packets for some fun trivia time and we sang along with some songs on the radio. We arrived just before lunch and we were all amazed at how packed it was. All the parking lots were full and there was a huge line to get in the gate! Luckily, we're members and members have their own gate so we didn't have to wait in line. I sat back and let the boys set the pace and the layout of our day. They wanted to start by heading to all the touch tanks. We pet sharks and alligators. We saw baby rays and stopped to read all about the relationship between clown fish and sea anemones. We went through the Amazon rainforest exhibit reading and answering all the questions on the interactive boards. We headed outside to find that the sun came out! We went into the Australian bird exhibit and fed parakeets. We learned how to get the birds to "step up" onto our stick and even how to encourage them to switch from stick to stick. We looked for frogs, turtles and fish in the ponds and marshes. We checked out the penguins, seals and sea lions. We stopped to see the beluga whales and finally had a nice late lunch. "a woman kindly hands her parakeet over to Evan"
After lunch we headed in to see the sea lion show. Typically, when we're there in the off season we just go in through the exit and so we've never walked through the main entrance to the theater. There were interactive displays about local sights to see, ocean and marine life, and a whole hallway dedicated to beluga whales. There were full color photographs, maps of all the provinces of Canada (that we just had to stop and look at!). I told the boys we should walk up there next time we come just to read and see it all, even if it doesn't lead to the show. The show started and we were thrilled to find that it was a totally different show than usual. It was so fun and playful and it even required audience participation! The sea lion can blow on a whistle for a VERY long time! Map of Canada; the boys were eager to study! After the show the boys wanted to head into the Titanic exhibit. Ian was very interested in the control room display and we started talking about Morse code-- what it is, how it works, etc. We could listen to actual Morse code messages sent back and forth from the Titanic to nearby ships. There was a map that would light up with the location of all the ships so we could see how far away they were. They even had a message written in Morse code so we could see the dots and dashes. It was very interesting! From there they played around the exhibit checking out the lights and buttons, the mini sub, and the interactive computer tables showing pictures of sea life, Titanic wreckage and things. They announced a Nautilus live tele-chat that Ian really wanted to sit in on and we convinced the other two boys to come along with us since it was only 20 minutes. We all LOVED it! The kids even got free activity books to bring home. The boys had me take their card so we could check out their website later on too. We can't wait to play around on NautilusLive.org. Alec was a bit nervous at first because he though they were still excavating the Titanic site and that tends to upset him. He was relieved to hear that the Nautilus was working in the Caribbean sea. We learned about sea floor mapping, sonar, satellites, ocean depths, plant and animal life, etc. I was impressed that a few times, when other adults in the audience were asking what type of animal we were seeing, Alec was able to tell me the answer before the scientists! We learned about underwater volcanoes, heating ducts/ vents and the sea life that has formed around them. We talked about hurricane season (since this was the last chat with the Nautilus for the time being. They pull into port for the September in hopes of missing the worst of hurricane season in the Caribbean. They were eager to look at and dive into their activity books right away! We went to take one last look at the penguins and then we headed home. The biggest water lilies we've ever seen! On our way out the boys all started playing around on the giant world map made out of concrete at the entrance/exit. I asked them if they could find the great lakes, and Alec went on to tell me all sorts of things like Central America, South America, we found Florida, Ct, Alaska, and so much more. Between reading all the signs, looking at all the maps, learning about the various animals, and exploring the Titanic we managed to cover reading, science, history and geography all in one trip! Looks like a fun day. 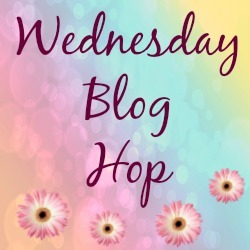 Lots of things to see and do :) Thanks for sharing at the Wednesday blog hop.